After spending the last two weeks watching all 8 Best Picture nominees for The 87th Annual Academy Awards, I am now fully qualified to give you the lowdown, determine which ones are the best, and more importantly which one will win the big prize. The crop this year includes the usual Oscars suspects: we have some historical/war films and biopics (Selma, Imitation Game, American Sniper); the movie about the person overcoming adversity (Theory of Everything); the quirky comedy (Grand Budapest Hotel); an original film by an international director (Birdman); a film by a long-admired Hollywood director (Boyhood), and the little indie that could (Whiplash). There’s a secret to picking these things. You see historically, Best Picture films don’t win without their directors nominated for Best Director. Simple math dictates that that leaves only 4 movies that can win Best Picture. But before I tell you who will win, let’s focus on the much more important question: Which movie should win? Let’s count them down from 8 – 1. Tonight is the live telecast for the 72nd annual Golden Globe Awards, and the winners of these film categories, given out by the Hollywood Foreign Press Association, often go on to snag an Oscar. Last year, 12 Years a Slave won Best Picture – Drama at the Globes, and then won the Oscar a month later; same with actors Jared Leto and Matthew McConaughey (both for Dallas Buyers Club); actress Cate Blanchett (for Blue Jasmine); and director Alfonso Cuaron (for Gravity). For the 2015 Globes, in the film Comedy/Musical category, Birdman leads the pack with seven nominations, including Best Picture, Best Director (Alejandro G. Iñárritu), and Best Actor (Michael Keaton), while in Drama, Boyhood and The Imitation Game are tied with five nods each. 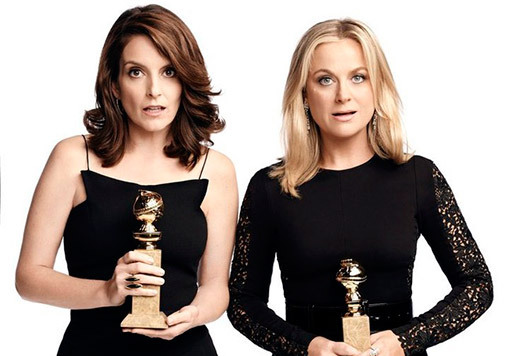 Watch the live 2015 Golden Globe Awards ceremony, hosted by SNL alums Tina Fey and Amy Poehler (their third year in a row hosting), tonight, January 11, 2015, at 8pm on NBC. You can view the full list of nominees here below and we’ll have a full list of winners posted here tonight after the ceremony. The Weinstein Company recently released the trailer for their upcoming film, The Imitation Game, which is based on the true story of Alan Turing (played Sherlock‘s Benedict Cumberbatch), a mathematician/cryptologist enlisted by the Allied forces during World War II to crack the German Enigma Code. The Imitation Game, which will arrive in theaters on November 21, 2014, is directed by Morten Tyldum, and stars Benedict Cumberbatch, Keira Knightley, Matthew Goode, Charles Dance, Mark Strong, Rory Kinnear, Allen Leech, and Matthew Beard.